I just returned from a trip to see family and friends in Merry Ole England. Planes, Trains, Automobiles and Buses were the modes of transport. As we caught the train from Aspley Guise to Bedford, England, the country side ambled by with a rhythm that was comforting. The views of fields of green grass with white sheep with black faces dotting the hillside. Small towns and villages with church steeples and stone houses between train stations beckoning me to jump off at each stop and explore. One such such town was Bedford. We made our way to the Higgins Museum http://www.thehigginsbedford.org.uk, a free community museum next to the River Great Ouse, complete with swans. The museum was so lovely, and my first surprise was to stumble upon an exhibit “EDWARD BAWDEN AND HIS STUDIO", one of the museums permanent collections. Edward Bawden (1903-1989) was a printmaker, illustrator, commercial artist, watercolorist, muralist and designer. The same strengths underlie all his work: wit, originality and unique way of seeing the world. 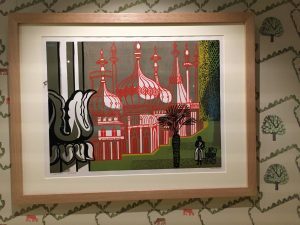 Today Bawden is recognized as one of the most influential of his generation. 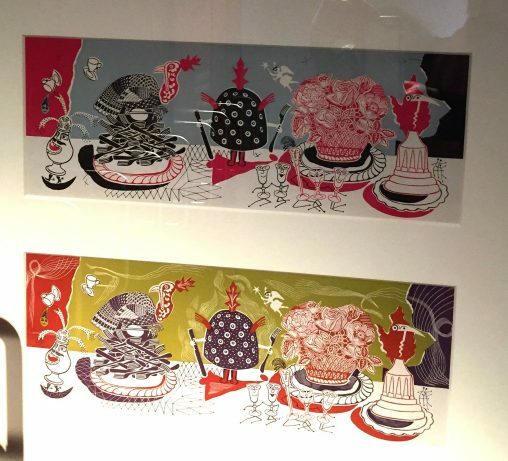 Between 1981-1989 Edward Bawden donated the contents of his studio to the Cecil Higgins Art Gallery. From the walls of his house, the insides of cupboards and drawers of his plan cabinets came plates and posters and photographs and letters: an entire life’s work.This exhibition focuses on Bawden’s life in the studio, from techniques he used to the linoleum he cut. 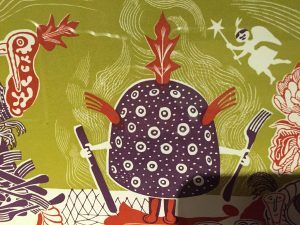 With smiles of acknowledged recognition of the labor involved in each lino cut plate and each layer of color achieved on the press, I wandered through this exhibit absorbing every image and appreciating each print. I was inspired once again to hurry back to my own studio at home to explore my newest techniques , images and ideas. Traveling in France With " Yellow Jackets "
THE ART OF WRITING A NOTE !